Coming from a conservative, fairly religious family, accepting and embracing the annual LGBTQ Pride celebration was difficult for me. Setting aside the answers to those questions for another blog, that’s exactly the kind of negative social pressure that all LGBTQ people have to deal with as youths and as adults. It’s a constant questioning of our right to exist and enjoy life on a path that’s just a little bit different. Early in my career, I worried about how being gay would affect my career. Coming out to friends in college was relatively easy; being out in Republican politics in the 1980s and 90s, not so much. It wasn’t until I was in my 30s, working as a journalist, that I felt comfortable to be out at work, and to switch allegiances to the political party that (usually) supported my right to exist without discrimination. Fast forward to today: I’ve been running my own PR business for almost nine years as an out-gay man, and for the most part, I don’t need to fear the effect on my business. As far as I know, it’s not an issue with any of my clients, and it’s a plus in my professional network. When I married my husband Lamar last year, we were showered with well wishes from our professional colleagues. 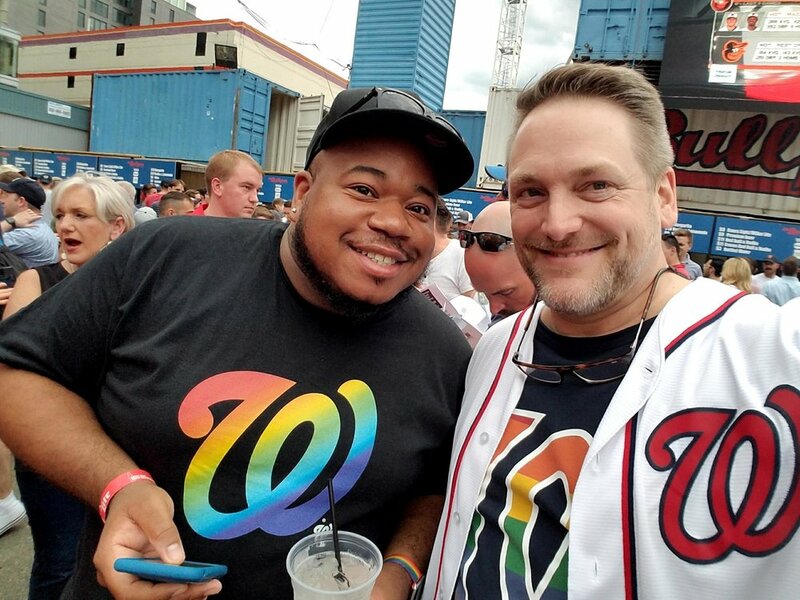 In recent years, I’ve stepped up my professional involvement in the LGBTQ community, and today I’m active in the Human Rights Campaign (as Table Captains co-chair for the 2018 National Dinner); Q Street (on the board of directors); and both the Capital Area Gay & Lesbian Chamber of Commerce and the National LGBT Chamber of Commerce, which certified DCC as an LGBT-owned business in 2017. While Team DCC continues to serve clients in a variety of industry and nonprofit sectors, I’m now hoping to put our team’s collective skills and experience to work for outstanding LGBTQ-related clients, as well. And yet hundreds of millions of Americans – and people in the other 95 percent of the world – still face daily pressures to hide who they are and who they love, at home and at work. Advocates of religious-based discrimination ignore some of the core tenets of their faith in their relentless dedication to discrimination and hate. For all these reasons, I am proud to work for LGBTQ equality – not just in June but all year-round – both in my personal life and in my business.